Songs of Eretz Poetry Review is pleased to introduce Alessio Zanelli to the readership as a new Frequent Contributor and Poet of the Week. His bio may be found on the “Our Staff” page. and stunned by the wheeze of the past. you had hardly managed to keep together. that broke against the jet of passion. their majestic shapes reduced to human scale. the most beautiful Morning Glory ever away. Poet’s Notes: This poem is about an old friend of mine, so big in both stature and soul, who seemed to have so long a distance to cover ahead of him but was forced to stop way too soon... Metaphor and parallels between weather events and human affairs are quite common in my poems. 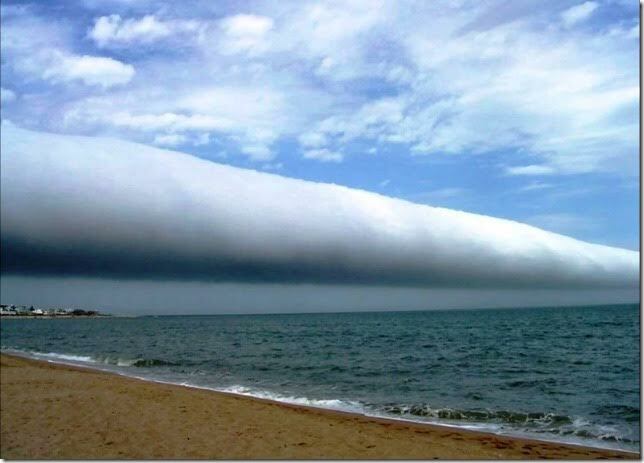 “Morning Glory” is the name of a particularly rare kind of roll cloud (pictured), which can extend for up to 1,000 km!